Situated at an altitude of nearly 1.400m compared to sea level, the climate of Suoi Giang similar to Sa Pa, Da Lat. Here visitors can climb to the ancient tea trees hundreds of years old, fresh green tea leaves picked the same girl Mongolian hospitality, or walk under Fokienia forest or waterfall adventures with Lang Episode buzz same cup water rub snow smoke spiraling up. A psychedelic, hard to describe makes people want to melt in unspoiled nature, mysterious. In Suoi Giang, there are thousands of several-hundred-year-old tea trees growing on the Hoang Lien Son range, at the height of about 1.400m above sea level. There are also many more-than-300-year-old trees which are among the oldest tea trees in the world with the circumference as long as 6 human arms’ total length. The weather here is temperate and often foggy, which is probably be the reason for Suoi Giang tea’s beautiful and unforgetable taste. 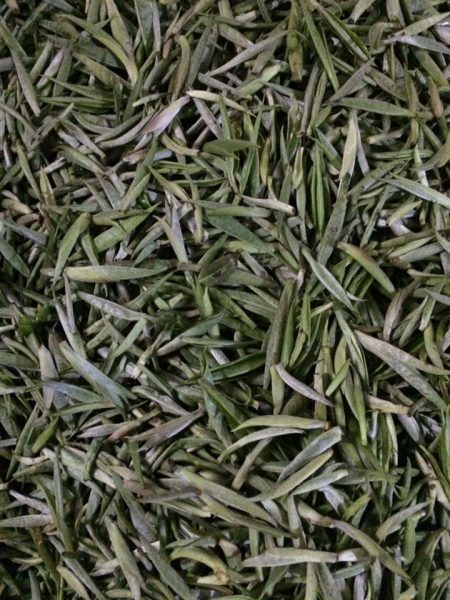 This is also what makes Suoi Giang green tea so famous in Vietnam. Whoever has a chance to visit Yen Bai couldn’t resist buying Suoi Giang tea as a gift for his or her friends and family. In the business trip to visit some Yen Bai’s Tea companies, SPIN experts had carried out a quick assessment in Suoi Giang, Van Chan of Yen Bai Province, studying their ability to take part in SPIN project. In Suoi Giang, there are thousands of several-hundred-year-old tea trees growing on the Hoang Lien Son range, at the height of about 1.400m above sea level. There are also many more-than-300-year-old trees which are among the oldest tea trees in the world with the circumference as long as 6 human arms’ total length. The weather here is temperate and often foggy, which is probably be the reason for Suoi Giang tea’s beautiful and unforgetable taste. 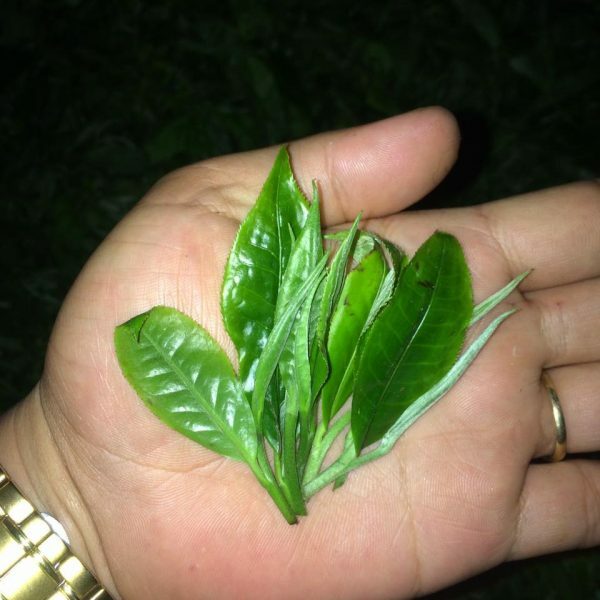 This is also what makes Suoi Giang green tea so famous in Vietnam. Whoever has a chance to visit Yen Bai couldn’t resist buying Suoi Giang tea as a gift for his or her friends and family. Suoi Giang tea trees totally grow in the nature. Absolutely there is no industrial technical or chemical effect. 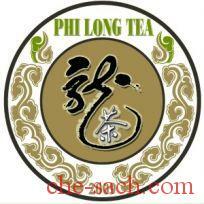 So the tea has special flavor, no drowsiness effect and is good for health. Times ago, the indigenous people made tea in the old way, by hand. After bringing fresh tea home, they pour tea leaves into an iron pan and dry on the wood fire. 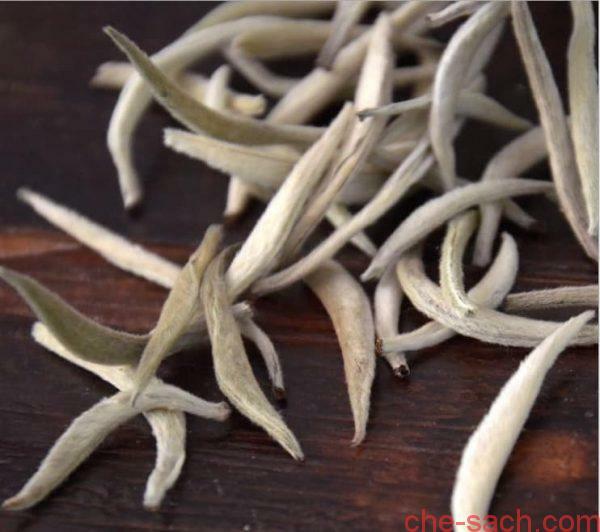 When the tea leaves are half-dryed, people put them in a flat basket and crush up by hand till they have curly shape and then put them back in the pan to make the tea totally dry. For careful people, the process of tea production includes some other stages such as mold-killing, tea favor-making and polishing. In the industrial era, a tea factory was built at the centre of Suoi Giang which produces 40-50 tons of tea per year. Although the tea is produced in modern production line, its flavor is still kept at classic quality. Tea drinkers still choose Suoi Ging products because of the honey-like color, strong scent, a little acrid but sweet taste. 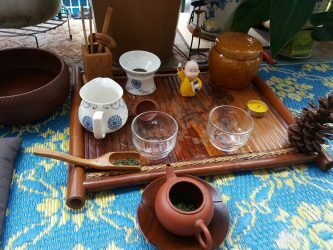 The tea became a good choice for Vietnamese in general and Yen Bai people in particular when they go somewhere or visit someone. 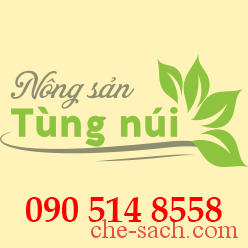 The brand name of Suoi Giang tea is so popular that it is hard to buy it eventhough its price is always about 10 times more expensive than the others. 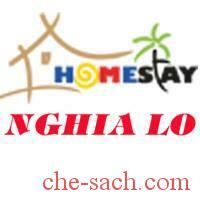 However famous in the past, Suoi Giang brand name is gradually weaker. 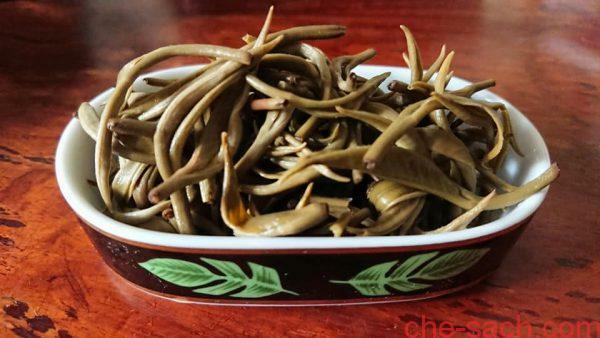 Tea connoisseurs are losing their faith in Suoi Giang products. 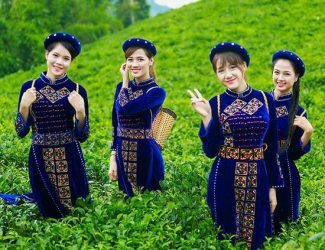 If the quality is not controlled well, Suoi Giang tea will definitely lose its reputation. 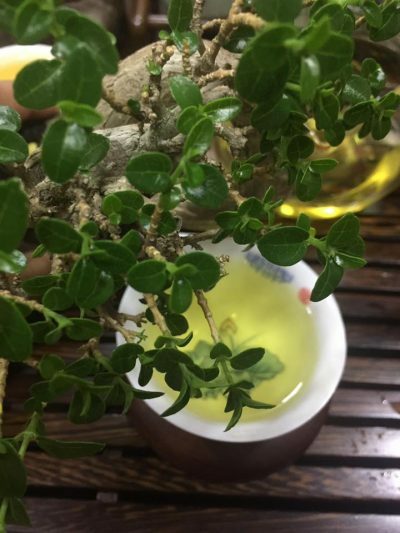 Currently, lots of products are being sold under the same brand name of Suoi Giang, but most of them make customers disappointed with low-quality-related problems such as dirty tea, inappropriate shape of tea buds and the tea water is in red color without identifiable scent and taste. Arcording to recent statistics, Suoi Giang has up to 300 ha of Snowy Shan tea, with 20,000 ancient trees producing only 300 tons of fresh tea bud per year. 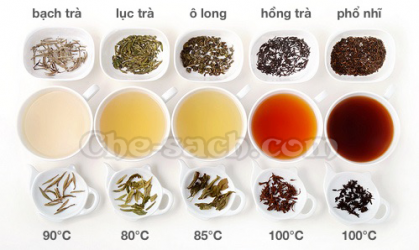 From this amount of fresh tea, Suoi Giang can only make about 55 tons of dried tea, whereas Suoi Giang tea products are sold everywhere, from Yen Bai, Lao Cai, Phu Tho to Ha Noi, HCMC,etc. and people can order as much as they want. Build a constant management system to closely control the quality of all Suoi Giang tea products; then consolidate Suoi Giang tea culture: present the product story; tighten up the link between producers, raw material region, selling system and the sustainable tourism spot integrated with Suoi Giang ancient tea (which is currently invested by Vietnam Ministry of Culture and Information). Educate H’Mong people on sustainable tea harvesting to ensure tea quality; develop new products; apply the new industrial technology to reduce material, water and energy used. Use compost and fertilizers originated from animals and herbaceous plants to grow tea trees to develop yield without reducing the tea quality. Supply modern technology to help ethnic people cook using agricultural waste products. 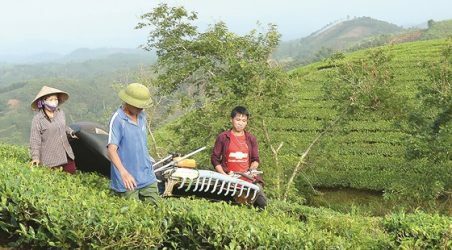 It is time for us to see our responsibilities in restoring reputation to Suoi Giang tea. We cannot allow some tea companies or individuals to cheat their customers and destroy the fame of this priceless product. 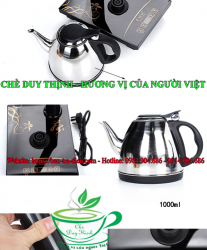 Hopefully, with the effort of Suoi Giang Cooperative, Duy Thinh tea company and the support from SPIN project, we can strengthen the brand name of Suoi Giang tea and bring it to all over the world.